The 2012 Buick Enclave Base crossover vehicle receives new hill-hold assist braking technology as a standard feature for 2012, as well as new Crystal Red Tintcoat and Stone Gray Metallic exterior colors. The automaker also adds an accessory power outlet to the center console. The Enclave seats up to 8 passengers in 3 rows, and offers a quiet, comfortable cabin equipped with such features as an 8-way power-adjustable driver's seat and a 2-way power-adjustable passenger seat, with cloth upholstery throughout the cabin. A leather-wrapped tilt/telescopic steering wheel with mahogany accents, tri-zone climate control and an auto-dimming rear-view mirror lend an upscale feel. Other standard features for the Enclave Base include steering-wheel-mounted audio and cruise controls, remote keyless entry, power windows and door locks, Bluetooth and an AM/FM audio system with SiriusXM satellite radio. Buick also includes the OnStar system with 6 months of the Directions and Connections plan, which includes turn-by-turn directions. Power for the front-wheel-drive Enclave Base comes from a 3.6-liter, direct-injection V6 engine, which produces 288 hp and 270 lb-ft of torque. The V6 links to a Hydra-Matic electronically controlled 6-speed automatic transmission and posts fuel economy numbers of 17/24 mpg. Standard safety features include the StabiliTrak electronic stability control system, as well as 6 airbags, daytime running lights, 4-wheel antilock brakes and traction control. Outside, standard features include automatic on/off HID headlights, foglights, a power liftgate, dual chrome exhaust tips and heated power side mirrors with integrated turn signals. The Enclave Base rides on 19-inch aluminum wheels. Buick equips the 2012 Enclave Convenience crossover vehicle with a number of standard features not found on the entry-level Base trim, including a rear-view camera, ultrasonic rear parking assist and a remote vehicle start system. Such features as an 8-way power-adjustable driver's seat, a 2-way power-adjustable passenger seat, tri-zone climate control and a leather-wrapped tilt/telescopic steering wheel with mahogany accents lend an upscale feel to the cabin. Other standard features for the Enclave Convenience include cloth upholstery, an auto-dimming rear-view mirror, steering-wheel-mounted audio and cruise controls, remote keyless entry, power windows and door locks, Bluetooth and an AM/FM audio system with SiriusXM satellite radio. Buick also includes its OnStar system with 6 months of the Directions and Connections plan. In addition, the automaker adds an accessory power outlet to the center console as a new standard feature for 2012. Navigation and a rear-seat entertainment system are among the optional features. A 3.6-liter, direct-injection V6 engine continues to power the front-wheel-drive Enclave Convenience. The V6 produces 288 hp and 270 lb-ft of torque, and connects to an electronically controlled 6-speed automatic transmission. Fuel economy numbers check in at 17/24 mpg. Safety features include the StabiliTrak electronic stability control system, as well as 6 airbags, daytime running lights, 4-wheel antilock brakes and traction control. Buick also adds new hill-hold assist braking technology as a standard safety feature for 2012. Outside, the Enclave Convenience AWD displays such exterior features as automatic on/off HID headlights, foglights, a power liftgate, dual chrome exhaust tips and heated power side mirrors with integrated turn signals. New exterior colors include Crystal Red Tintcoat and Stone Gray Metallic. The Enclave Convenience rides on 19-inch aluminum wheels. The 2012 Buick Enclave Base AWD crossover vehicle comes equipped with an Intelligent AWD system, which monitors traction for all 4 wheels and activates automatically when it detects wheel slippage, directing power to the wheels with the most traction. The AWD system channels power from a 3.6-liter V6 engine with direct injection and variable valve timing. It generates 288 hp and 270 lb-ft of torque, and links to an electronically controlled 6-speed automatic transmission. Fuel economy numbers check in at 16/22 mpg. Standard safety features include the StabiliTrak electronic stability control system, as well as 6 airbags, daytime running lights, 4-wheel antilock brakes and traction control. Buick also adds new hill-hold assist braking technology as a standard safety feature for 2012. The Enclave Base AWD's comfortable, well-equipped cabin receives such standard upscale features as an 8-way power-adjustable driver's seat, a 2-way power-adjustable passenger seat, a leather-wrapped tilt/telescopic steering wheel with mahogany accents, tri-zone climate control and an auto-dimming rear-view mirror. Other standard features include cloth upholstery, steering-wheel-mounted audio and cruise controls, remote keyless entry, power windows and door locks, Bluetooth and an AM/FM audio system with SiriusXM satellite radio. Buick also includes the OnStar system with 6 months of the Directions and Connections plan, which includes turn-by-turn directions. In addition, the automaker adds an accessory power outlet to the center console as a new standard feature for 2012. Outside, the Enclave Base AWD displays such standard features as automatic on/off HID headlights, foglights, a power liftgate, dual chrome exhaust tips and heated power side mirrors with integrated turn signals, as well as 19-inch aluminum wheels. The 2012 Buick Enclave Convenience AWD crossover vehicle delivers optimal traction and stability on all types of road surfaces, thanks to its Intelligent AWD system, which monitors traction for all 4 wheels and activates automatically when it detects wheel slippage, sending power to the wheels with the most traction. Power comes from a 3.6-liter V6 engine, which generates 288 hp and 270 lb-ft of torque. The engine links to a 6-speed automatic transmission and drives the Enclave from 0-60 in about 8.2 seconds. The EPA estimates fuel economy numbers of 16/22 mpg. Standard safety features include 4-wheel antilock brakes, traction control and the StabiliTrak electronic stability control system, as well as 6 airbags and daytime running lights. Buick also adds new hill-hold assist braking technology as a standard safety feature for 2012. Inside, the Enclave Convenience AWD comes well-equipped with such standard features as an 8-way power-adjustable driver's seat, a 2-way power-adjustable passenger seat, tri-zone climate control and a leather-wrapped tilt/telescopic steering wheel with mahogany accents, as well as a rear-view camera, ultrasonic rear parking assist and a remote vehicle start system. Other standard features for the Enclave Convenience include cloth upholstery, an auto-dimming rear-view mirror, steering-wheel-mounted audio and cruise controls, remote keyless entry and power windows and door locks. Tech features include Bluetooth, an AM/FM audio system with SiriusXM satellite radio and GM's OnStar system with 6 months of the Directions and Connections plan. In addition, the automaker adds an accessory power outlet to the center console as a new standard feature for 2012. Optional features include navigation and a rear-seat entertainment system. Outside, automatic on/off HID headlights, foglights, a power liftgate, dual chrome exhaust tips and heated power side mirrors with integrated turn signals are among the standard features. New exterior colors include Crystal Red Tintcoat and Stone Gray Metallic. The Enclave Convenience AWD rides on 19-inch aluminum wheels. Well-equipped for 2012, the Buick Enclave Leather receives such upscale standard features as perforated leather upholstery and heated front seats, as well as an 8-way power-adjustable driver's seat with memory settings, a 4-way power-adjustable passenger seat, tri-zone climate control and a leather-wrapped tilt/telescopic steering wheel with mahogany accents. Tech features include a remote vehicle start system, Bluetooth, an AM/FM audio system with SiriusXM satellite radio and GM's OnStar system with 6 months of the Directions and Connections plan. Other standard features for the Enclave Leather include an auto-dimming rear-view mirror, steering-wheel-mounted audio and cruise controls, remote keyless entry and power windows and door locks. In addition, the automaker adds an accessory power outlet to the center console as a new standard feature for 2012. Options include navigation and a rear-seat entertainment system. Power for the Enclave Leather comes from a 3.6-liter, direct-injection V6 engine, which delivers 288 hp and 270 lb-ft of torque. The V6 connects to an electronically controlled 6-speed automatic transmission and posts fuel economy numbers of 17/24 mpg. Standard safety features include a rear-view camera and ultrasonic rear parking assist, as well as 6 airbags, 4-wheel antilock brakes, traction control and the StabiliTrak electronic stability control system. Buick also adds new hill-hold assist braking technology for 2012. Outside, the Enclave Leather displays such exterior features as automatic on/off HID headlights, foglights, a power liftgate, dual chrome exhaust tips and heated power side mirrors with integrated turn signals. New exterior colors include Crystal Red Tintcoat and Stone Gray Metallic. The Enclave Leather rides on 19-inch machined aluminum wheels. 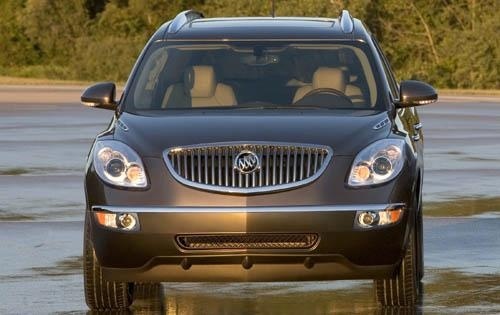 Buick equips the 2012 Enclave Leather AWD with its Intelligent AWD system, which monitors traction and activates automatically when it detects wheel slippage, sending power to the wheels with the most traction. The AWD system channels power from a 3.6-liter V6 engine, which generates 288 hp and 270 lb-ft of torque. The engine mates to a 6-speed automatic transmission and posts fuel economy numbers of 16/22 mpg. Standard safety features for the Enclave Leather AWD include a rear-view camera and ultrasonic rear parking assist, as well as 6 airbags, 4-wheel antilock brakes, traction control and the StabiliTrak electronic stability control system. The Enclave Leather AWD's comfortable, spacious cabin comes well-equipped with such upscale features as perforated leather upholstery, heated front seats, an 8-way power-adjustable driver's seat with memory settings, a 4-way power-adjustable passenger seat and a leather-wrapped tilt/telescopic steering wheel with mahogany accents. Tri-zone climate control, an auto-dimming rear-view mirror, steering-wheel-mounted audio and cruise controls, remote keyless entry and power windows and door locks also come standard. Tech features include a remote vehicle start system, Bluetooth, an AM/FM audio system with SiriusXM satellite radio and GM's OnStar system with 6 months of the Directions and Connections plan. Buick also adds an accessory power outlet to the center console as a new standard feature for 2012. Options include navigation and a rear-seat entertainment system. Outside, new exterior colors for 2012 include Crystal Red Tintcoat and Stone Gray Metallic. Standard exterior features include automatic on/off HID headlights, foglights, a power liftgate, dual chrome exhaust tips and heated power side mirrors with integrated turn signals. The Enclave Leather AWD rides on 19-inch machined aluminum wheels. As the top-of-the-line Enclave available for 2012, the Buick Enclave Premium crossover vehicle seats up to 8 passengers in its comfortable, well-equipped cabin, which includes such standard features as leather upholstery, heated and cooled front seats, a power tilt/telescopic steering wheel and a 10-speaker Bose audio system. The driver's seat features 8-way power adjustment with memory settings, while the passenger seat offers 4-way power adjustment. A leather-wrapped tilt/telescopic steering wheel with mahogany accents, tri-zone climate control and an auto-dimming rear-view mirror also add to the cabin's upscale feel. Tech features include a remote vehicle start system, Bluetooth and GM's OnStar system with 6 months of the Directions and Connections plan. Other standard features for the Enclave Premium include steering-wheel-mounted audio and cruise controls, remote keyless entry and power windows and door locks. In addition, Buick adds an accessory power outlet to the center console as a new standard feature for 2012. Options include navigation and a rear-seat entertainment system. Outside, Buick offers new Crystal Red Tintcoat and Stone Gray Metallic exterior colors for 2012. Automatic on/off HID headlights, foglights, a power liftgate, dual chrome exhaust tips and heated power side mirrors with integrated turn signals come standard, along with 19-inch chrome-clad aluminum wheels. Power comes from a 3.6-liter, direct-injection V6 engine, which puts out 288 hp and 270 lb-ft of torque. The V6 connects to a 6-speed automatic transmission and posts fuel economy numbers of 17/24 mpg. Standard safety features include a rear-view camera and ultrasonic rear parking assist, as well as 6 airbags, 4-wheel antilock brakes, traction control and the StabiliTrak electronic stability control system. Buick also adds new hill-hold assist braking technology as a standard safety feature for 2012. The top-of-the-line Buick Enclave Premium AWD combines optimal handling and good performance with an upscale cabin seating up to 8 passengers in three rows. The Intelligent AWD system monitors traction on all 4 wheels and activates automatically when it detects slippage, sending power to the wheels with the most traction. Power comes from a 3.6-liter V6 engine, which generates 288 hp and 270 lb-ft of torque. The V6 mates to a 6-speed automatic transmission, and posts fuel economy numbers of 16/22 mpg. Standard safety features for the Enclave Premium AWD include a rear-view camera and ultrasonic rear parking assist, as well as 6 airbags, 4-wheel antilock brakes, traction control and the StabiliTrak electronic stability control system. Buick also adds new hill-hold assist braking technology as a standard safety feature for 2012. The Enclave Premium's well-equipped interior includes such upscale features as leather upholstery, heated and cooled front seats, a power tilt/telescopic steering wheel and a 10-speaker Bose audio system. The driver's seat features 8-way power adjustment with memory settings, while the passenger seat offers 4-way power adjustment. A leather-wrapped tilt/telescopic steering wheel with mahogany accents, tri-zone climate control and an auto-dimming rear-view mirror also add to the cabin's upscale feel. Tech features include a remote vehicle start system, Bluetooth and GM's OnStar system with 6 months of the Directions and Connections plan. Other standard features for the Enclave Premium AWD include steering-wheel-mounted audio and cruise controls, remote keyless entry and power windows and door locks. In addition, Buick adds an accessory power outlet to the center console as a new standard feature for 2012. Options include navigation and a rear-seat entertainment system.